“Whaaaaaaat?” was the first thing that went through my head after finishing this book. It was shortly followed by: “But the… and the… what did she… and he… UGH!” after which I immediately flung down the book in disgust and retreated to my room. Seriously. It was that bad. And it had so much potential. Really, the only thing I can say right now is: “What were you smoking, Cat Patrick?” Honestly. I don’t think I’ve ever been so confused after finishing a book. Ever. It really did have so much potential. And I’m going to keep saying it until I can get this awful feeling out of my mind from reading this book. IT HAD SO MUCH POTENTIAL!!! And you completely ruined it, Cat Patrick. Completely. The storyline was so original! But there was just so much stuff so irritate me and want to rip every single page out of this book and burn it. Without mercy. And I do not treat books like that. My books do not have a single dog-eared page, or a single crease in the spine. They are perfect, and they will remain that way. So for me to want to rip out every single page of a book and burn it… That’s saying something. 1. The relationship between London and Luke. It was love at first sight. Literally. And it was so awfully clichéd and… ick. 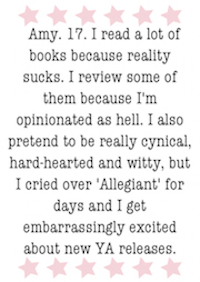 I just wanted to go and throw up at some parts of the book. She couldn’t even remember him half the time! And she was madly in love with him! Sorry (not really) for hating on the whole “insta-love” thing if it happened for you and your boyfriend/girlfriend/wife/dog/whatever. 2. The way the characters were so unrealistic. I mean, really. London just forgave her mother and Luke for lying to her practically for HER WHOLE RELATIONSHIP WITH BOTH OF THEM. Seriously? And all of them were so airy-fairy the whole time, and so two-dimensional. I had a hard time relating to any of the characters. You lost me, Cat Patrick. You really just lost me. I regret every minute I spent reading Forgotten, and, quite frankly, wish I had London’s backwards memory so I could never remember reading this.